A presentation of the modern systems of the French company Thales, designed for the "purple" line of the Baku Metro, was held on April 13. The presentation was held by the head of the Thales representative office in Azerbaijan Mehmet Shahan and the technical director Mikhail Malinovsky. The Baku Metro, which currently consists of three 36.6 km long lines and 25 stations, will turn into a network of five 119.1 km long lines and 76 stations. The most modern systems are used on the line that was commissioned during the period of independence, and the two operating stations. Shahan noted that the phased installation of systems began with the launch of the “purple” line. In the future, the entire metro infrastructure will be transferred to SCADA systems. “At the moment, four systems of the company Thales are installed on the "purple" line. This is a microprocessor system that controls the movement of trains, dispatching control, which already exists on the “purple” line, but will later cover the entire metro system, the Tetra radio communication system, which provides a connection between the driver and the train dispatcher, the control system of escalators and engineering structures and other equipment,” noted Shahan. “The first and third systems are already operational on the line. The movement of trains on the "green" and "red" lines is carried out using SAT-ALI systems (automatic speed control, automatic locomotive control). 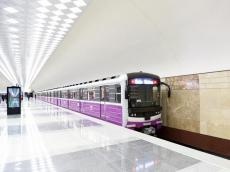 However, the CBTC systems, or the management of trains through radio waves, which is considered the latest product of technological development, starting with the “purple” line, will be the beginning of a completely new era in the Baku metro. This will increase the safety and speed of trains, shorten the intervals between them, save electricity,” he added. Shahan added that two of the Azerbaijani-French documents signed within Vice President of Azerbaijan Mehriban Aliyeva's visit to France on March 11, 2019, are related to the development of Baku Metro in recent years - Research agreement on the establishment of Operation Control Center and Agreement on the implementation of alarm and telecommunication systems of the Khojasan depot. Thales is one of the world leaders in the development and application of modern automation systems used in subways. The works started under the Memorandum of Understanding between the Baku Metro and Thales, signed during the Azerbaijan-France economic forum held in Baku on May 12, 2014. Baku metro, which was put into operation on November 6, 1967 is the public urban transport system linking underground railway lines in Azerbaijan. Having 25 stations on three lines – Green, Red and Purple – the Baku Metro is 36.63 km in length. By 2030, it is planned to expand the infrastructure of Baku Metro and create a giant underground transport network consisting of 76 stations, six electric depots, and five lines with a total length of 119.1 kilometers. Recently, Bakmil station of Baku Metro was opened after major overhaul. The reconstruction work started in August, 2017. The station was commissioned at the operating land site of Nariman Narimanov station on September 25, 1970 and has been operating as a station since 1979.